Ever been around a group of people who start sharing stories of their scars? I think it is easily one of those situations that turns into one-upping each other. People sure have some crazy stories… a lot of “stupid” stories… pretty miraculous stories… those scars we wear almost like trophies. and then there are those scars that we don’t show… the stories we don’t tell. “Unseen scars” bring shame, fear, regret, isolation. Perhaps the story is too sensitive to broadcast without great care and trust is a precious commodity. Maybe we aren’t sure anyone can truly understand our wounds. And yet, those scars affect us deeply and their effects may appear subtle are actually far reaching. Some scars fade over time, others will never leave us. Four years ago, I wrote about this tree. I’d walked by it for years. No, seriously, years… since 1998. I must have seen that wire digging in… I mean, how could I have missed it? And yet, it wasn’t until 2013 that I truly pondered the scars that tree bore. 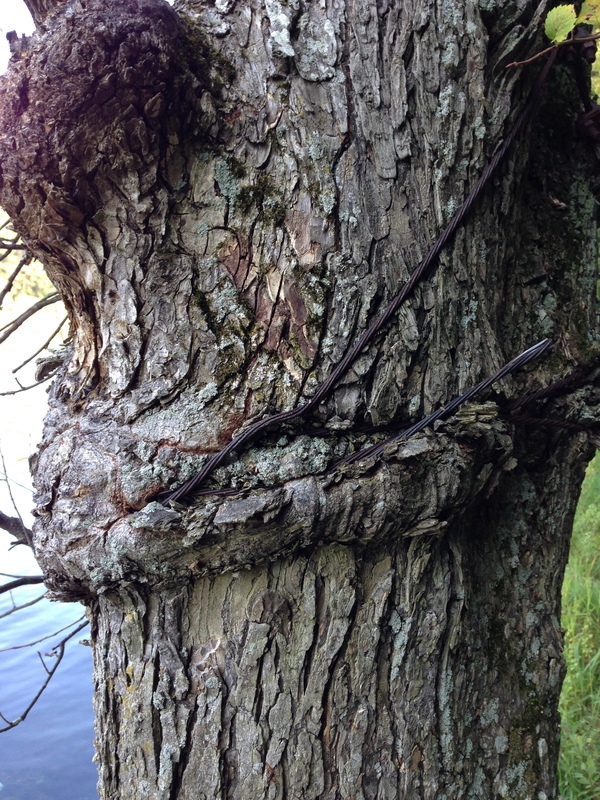 A cable attached around this tree trunk YEARS ago has now bitten into the bark, marred the tree, altered its growth, forever changed this tree. When out for a walk a few weeks ago I noticed the tree, but didn’t know why it stood out, because from a distance I couldn’t yet see… as I approached closer I could tell something wasn’t quite right… and as I stood next to the tree the true extent of the situation hit me. I even put my hand on the scars, wondering how I could help this predicament. How many years had passed since that tree was first bitten into by the unforgiving cable? How long did it grow with the metal digging in deep? And how many years had passed since the rest of the cable had been removed, and the tree was no longer tethered and yet still strangled? Sometimes that’s what we think healing looks like. Sometimes that’s what we think forgiveness looks like. But do we? Because, let me tell you, like that tree was no longer tethered, the cable connecting it to the power line had been removed. And yet, that cable still held a strangle hold on that tree. The beauty of the loving mercy and overwhelming grace of God is that in His great love for us, God who knows all about us- every sin, God who knows that effort on our part could never purify, God sent Jesus as the perfect sacrifice for us. We are healed! Sin has no dominion over us anymore. God remembers our sins no more. As far as the east is from the west, so far has he taken our sins from us. When we are forgiven, sin has no hold over us, we are no longer chained! But for many, while we are no longer tethered to our sins, the scars remain. and there we come to it, the heart of the struggle many of us face: we aren’t perfect. Scars are a glaring reminder that we aren’t perfect… but they show us who God is. We never were without blemish. And while may desperately want to be unblemished and untarnished… we aren’t. No matter our best efforts, we know it to be true in our lives what Romans 3:23 tells us, “for all have sinned and fall short of the glory of God.” We know it to be true because we live that reality every.single.day. No matter how hard we try, we cannot be perfect. Scars remind us that we are not perfect. But that isn’t a reason to despair. It is a reason to remember our hope, not in our own efforts, not in our own perfection… but hope in the loving mercy, amazing grace of the love of God that saved us through Christ. Our scars bear witness and give glory to God. We are often afraid that scars show our weakness, they do because we are, there’s no way around that. But they show the work of God and give Him glory that we aren’t left to our chains, we aren’t shackled to the punishment of our sins, but through his saving grace we are healed by the love of God through Christ’s sacrifice. Thinking on scripture I see evidence of scars giving glory to God: the woman at the well, Peter’s denial, Thomas’ doubt… in all of those situations God was ultimately glorified. When your scars have you questioning, when the scars send you into hiding, when the scars leave you feeling shackled… remind yourself that they bear testimony… not to who you are not… but they bear testimony to who God is. That our just, good, true, loving, righteous Father is our Savior, redeemer and healer. Those scars bear testimony to the mercy, grace and love of God. Maybe today is a day to surrender your strength to Him and allow God to be perfect in your weakness. Not as an excuse to keep on sinning but as an opportunity to thank and praise God and bear witness to His power at work!